Next Week – Free Bracket Contest! 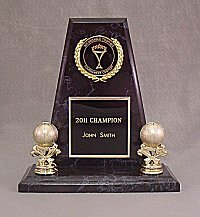 This is just a reminder that the fun will start next week for the Affordable Trophies Invitational Tournament Contest. Be sure to register early so that you will receive notification as soon as the brackets are posted! For more details, see our previous blog entry. The winner of the contest will receive the trophy pictured on the left, with their name engraved!